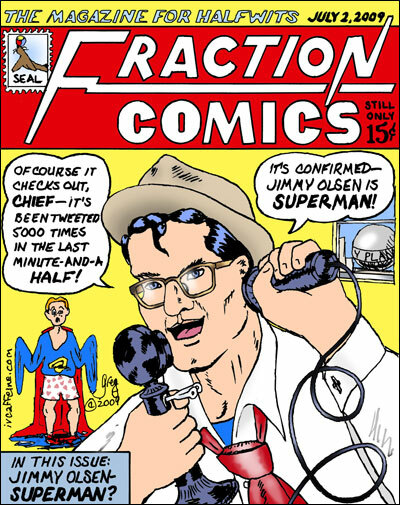 We Know You’re Superman, Jimmy–We Heard It On Twitter! Well, it’s became an even worse week for celebrities. Karl Malden passed away the other day, my GOD, the man was 97, that means back when he was doing all those American Express commercials, he was in his vigorous 70s! For some people, death is God’s way of telling you to take a vacation. And with all these deaths going on, Richard Wilkins of Australia’s Channel Nine, announced that Jeff Goldblum had also died. He’d read it on Twitter and as we all know, what you read on Twitter you can take to the bank. Well, it seems as if rumors of Jeff Goldblum’s demise were somewhat premature–as we found out on the Colbert Report where Jeff Goldblum delivered a eulogy for…Jeff Goldblum. Which brings up a question–are we supposed to treat Twitter as a reliable news source? Looks like CNN, MSNBC and Fox News are doing it here in the States. After all, would anyone tweet something that wasn’t true? The problem is, as newspaper editors and publishers have been finding out, the 24 hour news cycle is soooooooo last century. With the advent of blogs, we shifted to a 1440 MINUTE news cycle and now with Twitter, an 86,400 SECOND news cycle. Who will be the first to tweet the findings of Michael Jackson’s autopsy? How fast will it spread over cyberspace? Will it be the real news, or will someone be tweeting a hoax? Just to clear things up, no, people who read comics are NOT halfwits–if I thought they were, I wouldn’t be DRAWING them–but I just couldn’t resist the play on words with Fraction Comics.